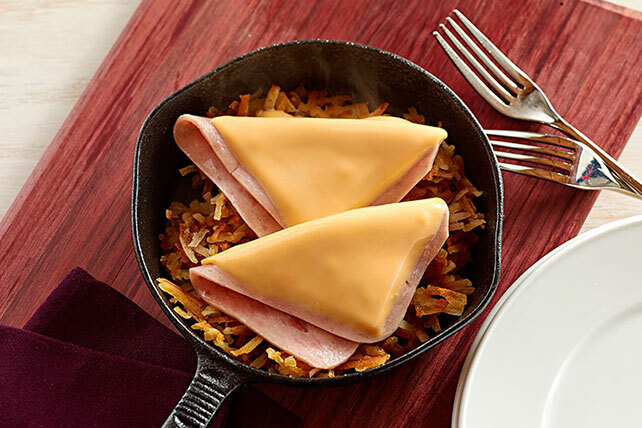 Golden hash brown potatoes are served with a topping of sliced ham and melted cheese in this delicious breakfast entrée. Melt butter in small skillet on medium heat. Add potatoes; cook 15 min. or until golden brown on both sides, turning after 8 min. Top with ham and Singles; cover. Cook 2 min. or until Singles are melted. Serve this satisfying entrée with a fresh fruit salad. Garnish with chopped fresh chives before serving.